"It's hard to imagine anyone in this role but Redford. Without him, there would be little here worth seeing." "[Redford] delivers a glorious, sly performance in a gloriously sly movie that masks its idiosyncrasy in brisk and breezy storytelling." "It's a fitting send-off for a legendary Hollywood figure." 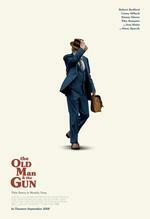 "THE OLD MAN AND THE GUN is as old-fashioned and sincere, as temperamentally un-postmodern, as it's possible for a movie to be."